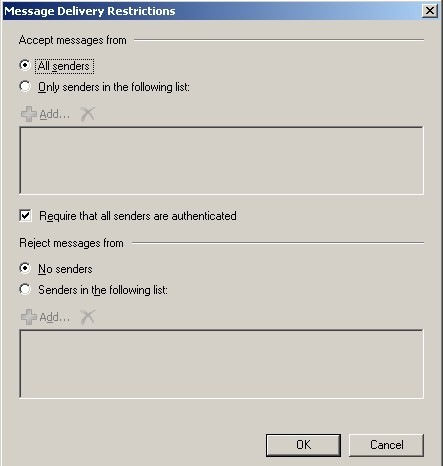 I recently ran across an issue where one company was setting the “Require that all senders are authenticated” checkbox on a particular mail distribution group in Exchange 2007. Most organizations will do this, to ensure that only users of the internal Exchange organization can email this group, effectively stopping external users from emailing it. This is particularly useful if the group is an extremely broad group such as “ALLUSERS” or something similar. The problem was that even with this checked, the group was still receiving emails from outside senders. What gives? Well, I started doing a little digging, and this is what I found. The company had followed this article by Scott Landry of the Exchange Team. 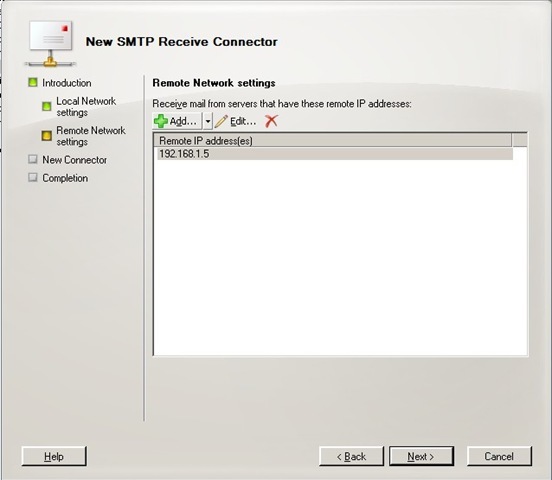 The articles discusses two ways to allow application servers to relay through Exchange 2007, applications such as SharePoint. If you read Scott’s article, his tone indicates that these applications are really internal applications. He also lists two method’s for doing so. The first being to set the receive connector to externally secured, and the second with manually applying permissions using powershell. The company who was having this issue, had used the first method, eternally secured, but was using it to allow a 3rd party SMTP server that was used for spam filtering on it’s DMZ, to relay into Exchange. So what’s the problem? Essentially the method they used, gave TOO much permission to the 3rd party server. Let’s take a look. Now, any email from this connector, will bypass the “Require That All Senders are Authenticated” check box, because according to Exchange 2007, they are authenticated! So, how do you fix it? It couldn’t be easier, Scott’s article already tells us how. He lists Option 2, grant the relay permission to Anonymous Users on the connector. That’s it. Now, the third party server can send emails into the organization, but they are treated as outside emails. This means they will be subject to size limit’s, anti-spam, as well as being rejected if they are sent to a group that has the “Require That All Senders Are Authenticated” setting checked.